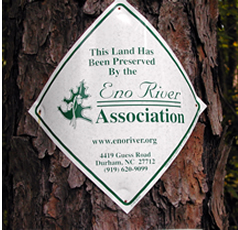 The Eno River Association’s land protection program is at the heart of our mission. Since 1966, the Association has worked actively to conserve the lands and waters along the Eno River and its tributaries. We protect water quality, wildlife habitat, and ecological diversity, while also working to provide recreational opportunities and scenic open spaces that connect people to the natural environment of the Eno River basin. Land protection is accomplished by working in partnership with landowners to permanently protect important natural areas. We achieve protection in a variety of ways, including fee simple purchase of lands for parks and nature preserves, as well as the use of conservation easements which leave the land in private hands while safeguarding its important natural resources. Contributions to the Margaret C. Nygard Land Acquistion Fund and the Allen Lloyd Fund for the Protection of the Upper Eno support the purchase of conservation lands and easements. What Types of Properties are Appropriate for Land Conservation? 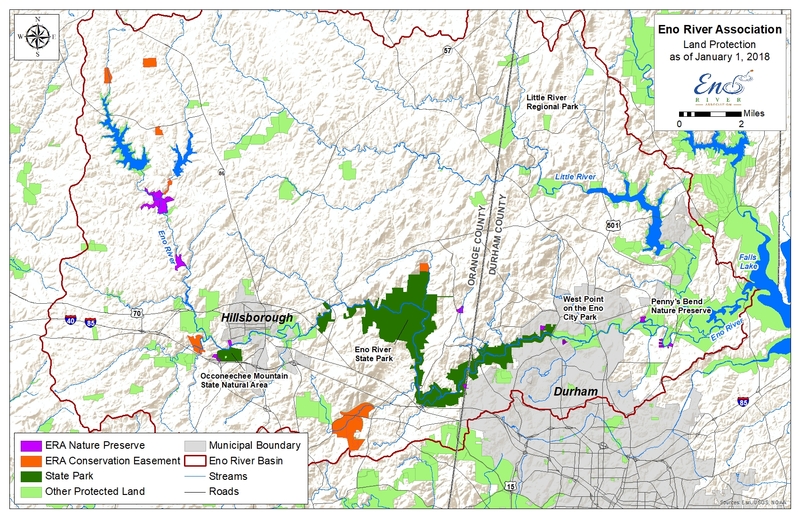 If you own land in the Eno River Basin (click to see map), we would be happy to speak with you about protecting it. It can be as small as 1 acre or larger than 100 acres. We are especially interested if your property has river or stream frontage, woodlands, or cultural or historical resources. For more information, please contact Stephanie Panlasigui at (919) 620-9099 ext. 206, or email Stephanie@enoriver.org. How does the Eno River Association help landowners to protect their land? If you’re interested in selling or donating your land, the Association can definitely work with you. You can sell the land outright at its market value, donate it, or do a combination of the two and sell the land at less than its market value (a bargain sale), using the price difference as a charitable gift. We would manage the property in the manner that suits it best; in many instances we eventually transfer the property to the Eno River State Park, but we also retain ownership and manage a number of properties throughout Durham and Orange Counties. If you would like to protect your property without selling it, granting a conservation easement may suit your needs best. Conservation easements are legal agreements that establish permanent restrictions on use and development of the land while keeping it in private hands. Landowners can use conservation easements to protect their property’s natural, cultural, and historical resources without selling it. Each easement is unique and is tailored to meet the needs and wishes of the individual landowner. Granting an easement entrusts the Association with the responsibility to monitor and enforce the restrictions put in place by the landowner. Easements can be purchased or donated outright, and usually help landowners receive favorable income, gift, or estate tax benefits. If making a permanent commitment to protect your property through a conservation easement is not the right step for you, there are many state and federal programs that provide technical and financial assistance for those that are interested in implementing conservation practices on their property. They range from one year to permanent contracts, and can provide technical support and cost-sharing for your conservation activities. The Association works closely with our local Soil and Water Conservation Districts and would be happy to work with you to find a program that best fits your needs. The Eno River Association partners with a number of different groups in order to protect land throughout the Eno River Basin. We work regularly with Durham and Orange Counties, the North Carolina Plant Conservation Program, the North Carolina Botanical Garden, the Triangle Land Conservancy, and other groups in order to protect land together that none of us would be able to protect by working alone. These partnerships have been critical throughout the region, and have helped to create the Eno River State Park, the Little River Regional Park, and have also helped to protect land around the Penny’s Bend Nature Preserve. 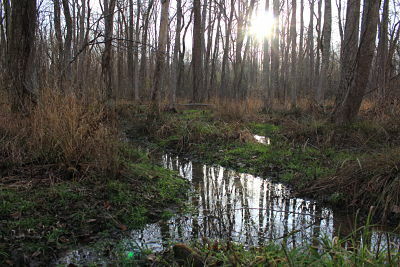 Photo of forested wetlands within our most recently acquired land, purchased on December 19, 2017.